Equi-Sential® Max Joint Care is a specially formulated joint supplement, for horses, that contains glucosamine, chondroitin, and MSM (methyl sulfonyl methane); the top three leading supplements for joint therapy. 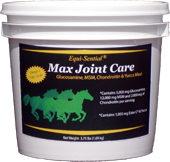 Equi-Sential® Max Joint Care also contains Ester C® (Vitamin C) and Natural Vitamin E, powerful antioxidants which promotes the healing process and is essential for cartilage formation. Furthermore, yucca was added to enhance the performance of the product with its pain relieving attributes.